To talk of El Paso is to talk of two cultures and two countries: the United States and Mexico. It's about Americans and Mexicans, separated by a dividing line, tightly connected by their roots and traditions that are more than 400 years old. El Paso is a city of the Wild West and was born in a dry and inhospitable area and was a city that was previously filled with hired guns, sheriffs, cattle ranchers and saloons. Now, it is an inviting and friendly community that has been formed by two cultures that offer the best of the west of Texas. Discover everything that this beautiful Texan city has to offer: extraordinary mountainous desert-like landscapes, wonderful cooking, friendly people who want to share the beauty of Texas with visitors and its past of traditions, influenced by the Spanish missions that were built in the area centuries ago. 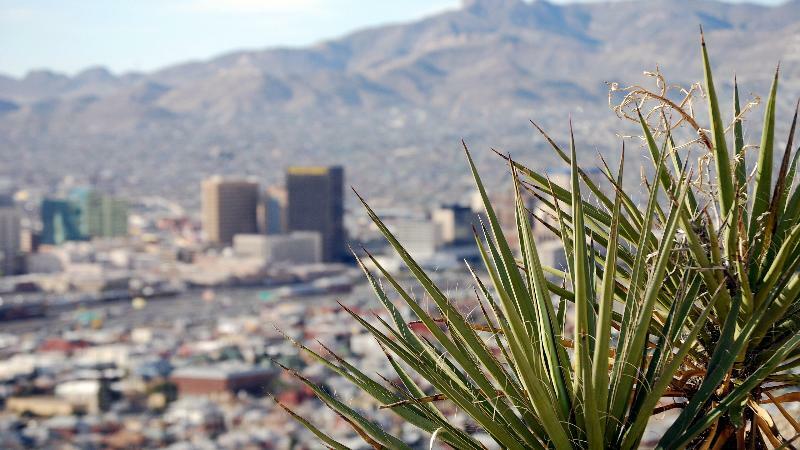 El Paso is a metropolis of over half a million inhabitants. It is the sixth most populated city in Texas, which is the second largest state of the United States. It is right on the border with Ciudad Juarez, Mexico. The Franklin Mountains cleave the city in two, which is also divided into five sections: West El Paso, Central El Paso, Northeast El Paso, East El Paso and Mission Valley El Paso. The metropolitan area of El Paso-Ciudad Juarez is the largest on the US-Mexico border, made up of 2.6 million people from both countries. The city has two international airports, the El Paso International Airport and the Abraham Gonzalez International Airport in Ciudad Juarez. There are also five crossing points between Mexico and the United States, facilitating entry into either country. El Paso offers great weather all year around. Summers can get pretty hot with a bit of humidity, especially in June. Winters aren't that cold, with January is the coldest month of the season. The annual average temperature is about 64 degrees Fahrenheit. With the Treaty of Guadalupe Hidalgo in 1848, the war between Mexico and the United States ended. The independence of the Republic of Texas and the sale of Mexican territory to the US were recognized by Mexico. Two years later, the County of El Paso, Texas was established. After the arrival of the railroad in 1881, El Paso became the city of sin and the capital of the revolver. The streets were lined with brothels, saloons and places to gamble. Today, the region that was previously known as "Paso del Norte" is now the home of two important cities: Ciudad Juarez in Mexico and El Paso in the US, an interesting urban area where more than two million people of two distinct cultures co-inhabit. El Paso is a colorful and modern city where there is a mix of Mexicans from the north and Americans from the south, combining traditions, gastronomy and attractions, offering visitors from all over the world a unique southwestern ambiance. El Paso offers an excellent gamma of shopping malls and stores where you can buy everything from a city postcard to a pair of expensive ostrich boots. Like most American cities, El Paso is a true paradise for shoppers, for both locals and visitors. Come and enjoy the many attractions of El Paso, also known as "Sun City," where you can find sunny weather 300 days out of the year.